Nice sky-blue flowers in summer. Devon Skies has lovely sky-blue flowers for much of the summer on clumps of long, narrow leaves. The flowers are nicely veined leading to darker centres and have little yellow eyes. 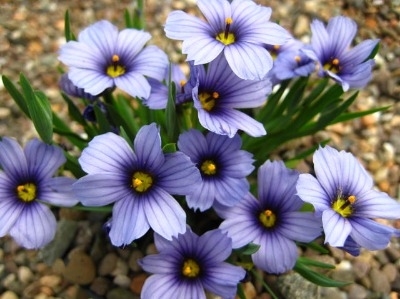 Like most Sisyrinchium this one enjoys sunshine and a well-drained but slightly moist soil - so long as it doesn't dry out, it will be happy and is really quite easy to grow.